A new report by Cambridge Community Foundation charts the impact of trends in housing, education and income disparity that threaten the city's prized culture of diversity and inclusion, even as its enviable role in a regional innovation economy drives soaring levels of prosperity. A review of relevant data raises questions about whether this growth actually benefits city residents–or whether a growing financial disconnect means many residents can no longer afford the city they live in. Fully 78 percent of current low-income households in Cambridge are "cost burdened," spending more than 30 percent of their income on housing. Over half spend over 50 percent of total income on housing. They qualify as "severely cost burdened." In 2015, Just 4 percent of the city's rental housing stock was affordable for a family with two workers earning $75,000 a year in total – in a community with a median annual household income of just over $79,000. The cost of buying a home is inevitably further out of reach: just 2 percent of single-family homes and 9 percent of condominiums are affordable for a family earning $75,000 a year total. Closely related to the housing situation is a growing income gap as the city moves toward a divide between rich and poor with those in the middle squeezed out. One consequence: the number of low- and middle- income residents in the city has declined in recent years while high–income residents have dramatically increased as a proportion of the whole. 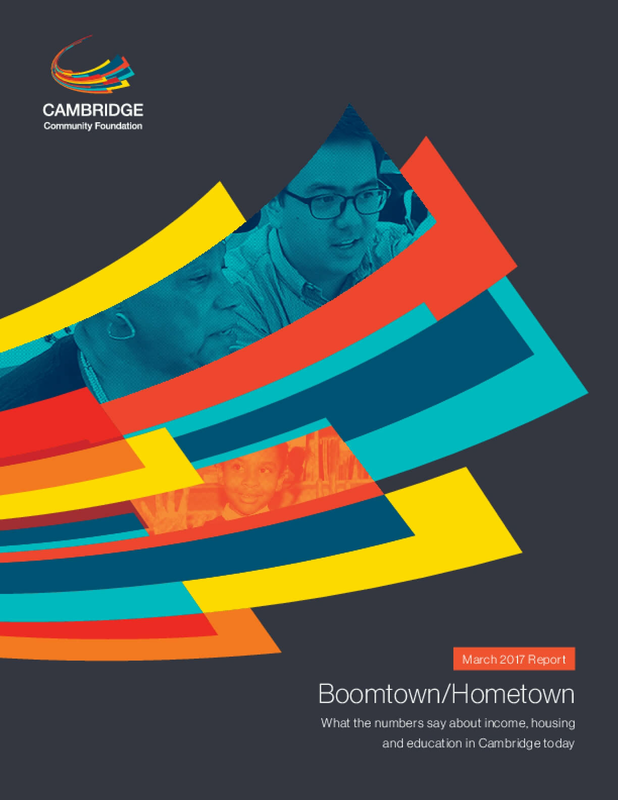 The report, titled Boomtown/Hometown: What the Numbers Say about Income, Housing and Education in Cambridge Today, was developed with data contributions from the city and from the Metropolitan Area Planning Council. It identifies a serious threat to a tradition of cohesiveness and inclusivity, signatures of this small city with its long history as a global education center, immigrant destination and creative industrial sparkplug. Copyright 2017 by Cambridge Community Foundation. All rights reserved.